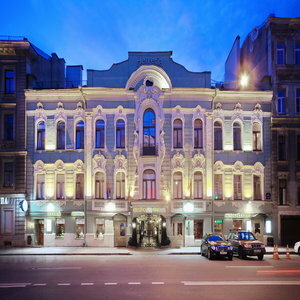 The Helvetia Hotel was opened in 2003, in a mansion built in the 18th century and reconstructed in the middle of the 19th century by the famous St.Petersburg architect Augusto Lange. The hotel is situated in the centre of the city. Immediate vicinity to the main artery of the city - Nevsky avenue - allows to take promenades to most of places of interest, administrative and office buildings. Besides, there are three metro stations at 500 metres from the hotel (Ploschad Vosstaniya, Mayakovskaya and Dostoyevskaya), which allow to get to almost all parts of the city within 20 minutes. 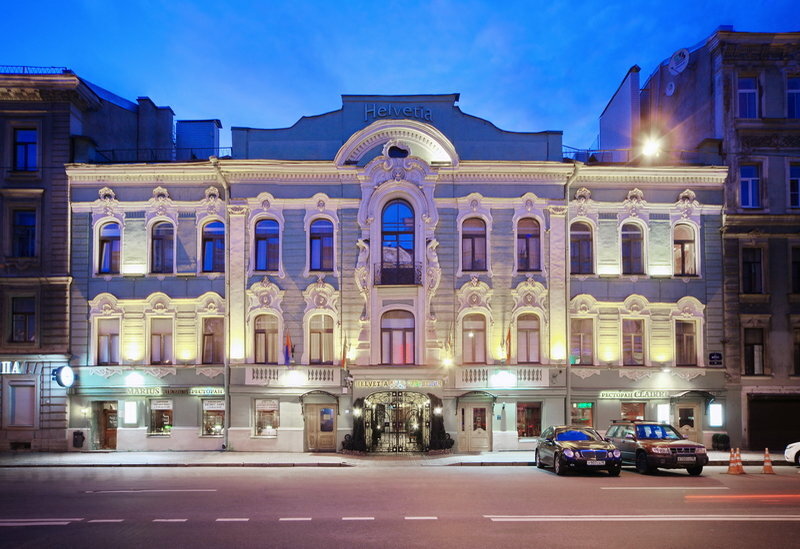 After restoration and reconstruction of the architectural complex in 1999-2003, the hotel became "a piece of Switzerland" maintaining noble signs of St.Petersburg style. In summer open-air performances are organized in the enclosed court of the hotel forming a cycle called Helvetia Music. The partners and guests of the hotel are welcome to see the true value of modern Swiss art, as well as talented Russian and European creative teams. The Helvetia hotel is very popular among writers and painters, artists and poets, young restorers and art historians. The hotel offers accommodation in 59 rooms of the following categories: Classic room, Superior room, Studio Suite, Family Suite. All rooms are decorated in a classical style with modern or baroque elements. Guests will find full comfort and casual elegance throughout the hotel's classical guest rooms. Each room of the hotel is a place to feel at home. All the rooms have hardwood flooring, new comfortable furniture, spacious bathrooms, TV and Wi-Fi. Guests are invited to the hotel restaurant Marius Pub. It is a taste of the true Swiss service experience. The polished wood pub is decorated with the perfectly faded wall murals depicting Middle-Ages town-folk engaged in all sorts of merry-making around the dinner table. The pub is well-lit, features a quality sound system and a wide selection of the beer cuisine and bottled beers. The hotel offers an extensive range of extra services including: safe deposit boxes, luggage room, Internet room, business services, Wi-Fi, room service, tour guides and interpreters, excursions, ticket booking, laundry and dry-cleaning services, cash points and currency exchange, souvenir boutique, visa support, guarded parking, taxi services, transfers, car rent, and many others.